A couple of years ago when our Office Manager Kristin moved, we asked Dard to make her a family message center for her new home. There it hangs today reminding anyone who heads out the back door to the car of dentist and doctor appointments, special school schedules, needed groceries and sometimes even love notes. And as expected, Dard did his usual fine mortise and tenon construction; to say it was a perfect house warming gift is an understatement. Then Dard heard of a school nearby to his Chillicothe Ohio home that was being demolished and scavenger that he is, out came the slate and voila, now Dard has added OUR chalkboards to his product line. 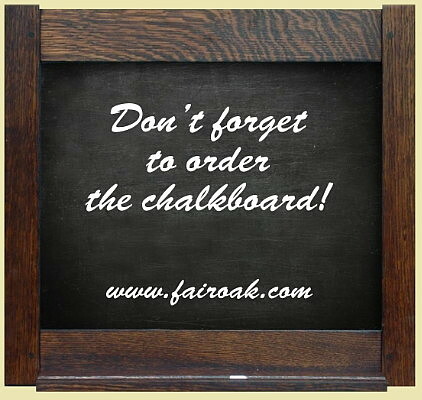 So we think its about time we add OUR chalkboards made by Dard Hunter Studios to our website as well. The medium brown hand finished arts & crafts mortise and tenon frame is constructed of select quartersawn oak. The slate is REAL (making it quite heavy). The standard size is 23 1/2" w by 22" h and with the chalk tray, it is about 4" deep. Due to its weight, we must also add a $15 shipping surcharge. Custom sizes are available, please call for a quote.